We haven't yet had Lego Harry Potter: Years 1 to 4 but fans of the boy wizard and whichever-of-his-friends-you-still-think-is-alive needn't worry about getting short-changed on the magic happenings this year, with EA and Warner Bros. announcing two new Potter titles are on the way. 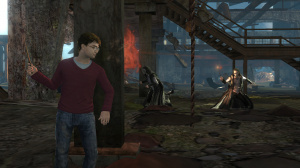 Based on the final two films in the series, Harry Potter and the Deathly Hallows Part 1 sees the wizards leave Hogwarts to escape from a bloodthirsty scrum of enemies, making it easy to see why Jonathan Bunney, Head of Production over at EA Brightlight, claims the title is the darkest and most action-oriented in the series yet. Heading to both Wii and DS, the first part of the game-movie combo is expected to launch in Autumn this year, and we'll be bringing you more screenshots and trailers as they emerge from the dim and dark world of wizarding. My cousin will like this. The crazy annoying 7 year old who can't read one. I refuse to support this project in any way. Dividing the book into two movies/games/cash cows is ridiculous. It's not even the longest book and most of the first half is forgettable. ^ Who says they're filming that stuff? There's a LOT of important stuff they just can't cut out. Most of the books have tons of sub plots that they rip out for the movie, the 7th doesn't. Expect a few camping scenes, and then plot point after plot point in the movies. If they do it right..
@Popyman: Little too late for that. Instead of recasting, they've decided to completey cut Crabbe out of the film and are giving his role to Goyle. That alone equals instafail. I lol'd at the statement of this being the most action packed game in the series yet. That's not so hard considering that in past games you felt more like a janitor instead of a powerful wizard hero. I wish developers wouldn't split crummy movie games up like this and cruelly trick people into buying both. Surprise, surprise. Warner Bros. is being greedy by making people pay twice to watch the movie, so why shouldn't EA charge twice to play the same game? The main reason the movie is being split in 2 is because they know Harry Potter fans will be willing and stupid enough to pay twice. I just never got the whole Harry Potter thing. Sure, I'm not the target age range, but the whole thing is cliche, and after reading spoilers, the way the villain finally got pwned was very anticlimactic. Judging from videofotage this game looks decent if you´re into Harry Potter. Still, it´s a licencegame that will probably not surprise you. My favorite game in the series was the Sorcerer's Stone (and I guess CoS) on my Game Boy Color. After that they started to decline in quality and 'funness'. I stopped at the fourth one... and then I got the fifth one for Christmas. That, people, is worthy of a facepalm. BTW, I beat that one in an hour. EDIT: An hour I will never get back.